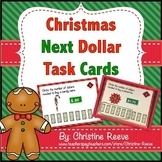 This set includes 40 task cards with fabricated apps with prices for using the next dollar up strategy. 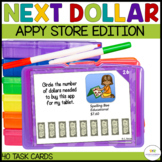 In the next dollar up strategy, the student chooses the next dollar up from the price tag so that even without being able to make change, he can make a purchase and know how much he can afford. 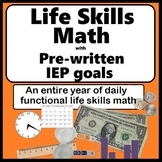 This quiz/test is for students in life skills math or liberal arts math. 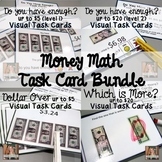 It includes place value, rounding, multiplication, interpreting graphs. 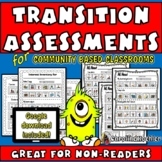 There are two different tests. 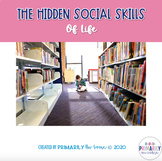 This quiz is for mid level students with disabilities. 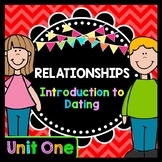 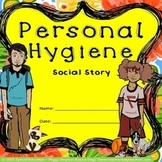 It covers healthy relationships, social skills, safety, how to react in emergency situations, safety sings, and food safety. 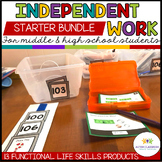 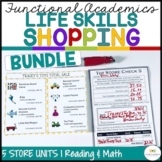 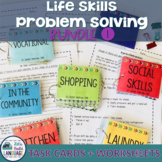 Life Skills Problem Solving Bundle SAVE!